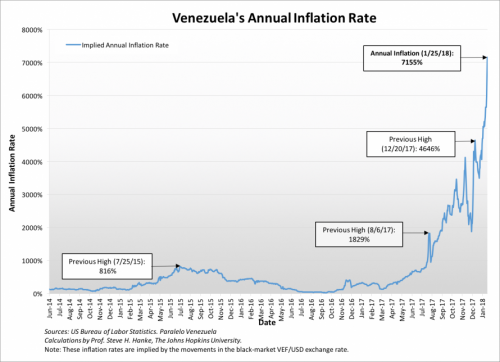 EconomicPolicyJournal.com: Venezuelan Price Inflation Jumps By 1,000% in One Day!! Venezuelan Price Inflation Jumps By 1,000% in One Day!! Yesterday, Venezuelan inflation surpassed 6,000% for the first time. Today, it has surpassed 7,000%, sitting at 7,155%. #Venezuela is in an economic free fall.